To grab a current Tender Business Opportunity, We have Live Tenders section available on each of our search segment. To identify live, Current or Latest Tender Opportunity of your product or services interested, Live Tenders section is available. 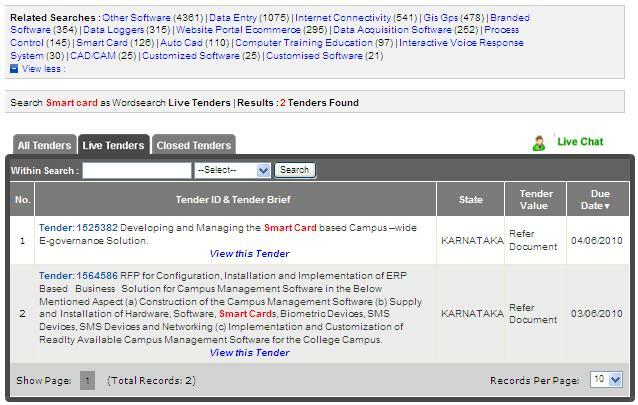 User has also the facility to refine Tender search in Live Tenders section also. User can sort Tenders on Tender ID, Last Date of Bid Submission, state or Tender Value in Ascending or Descending Order. Tradereader.com also facilitates its users for Instant access of this Tender Information. By clicking on Tender Brief user will be redirecting to login page where existing user can view this tender detail by providing their User ID & Password. New User can get this tender Information by Paying Rs. 552.00 through their Credit card or Debit Card.